Just Jingle: It's STAMPTEMBER® time! Yes, that's right! It's STAMPTEMBER® time at Simon Says Stamp! If you haven't heard of Stamptember® you are in for a treat! LOTS and LOTS of fabulous new products, blog hops, inspiration, prizes, and more!!! There is so much going on and it is SO MUCH FUN! I will be sharing some fun cards with you using goodies from this fabulous release all week this week! I think you are going to LOVE them! I will begin with this simple fall beauty! I am in LOVE with this gorgeous Real Leaves stamp set! The detail on these is just amazing! And yes, there is a set of dies to coordinate with it, as well! Gorgeous, folks! Absolutely gorgeous! I heat embossed the design with gold and then added some May Arts burlap string for a simple, but striking fall look. The sentiment is from the new Feast of Thanksgiving stamp set, which is WICKED cute! Doesn't it just make you want to whip up a batch of pumpkin spice cupcakes, wrap 'em up, add this pretty card and deliver them to a friend?! Do it! I'm hoping I am that friend. HA! No, but really, such a simple way to give a wonderful smile as autumn begins! aww pretty card.. love that big leaf.. I love that pretty leaf! Fabulous card. Wow! Stunning card! Love that the leaf is center stage! It's gorgeous!!! Beautiful, flawless card!!! I'm loving all this fall inspiration! Beautiful card! Beautiful CAS card! 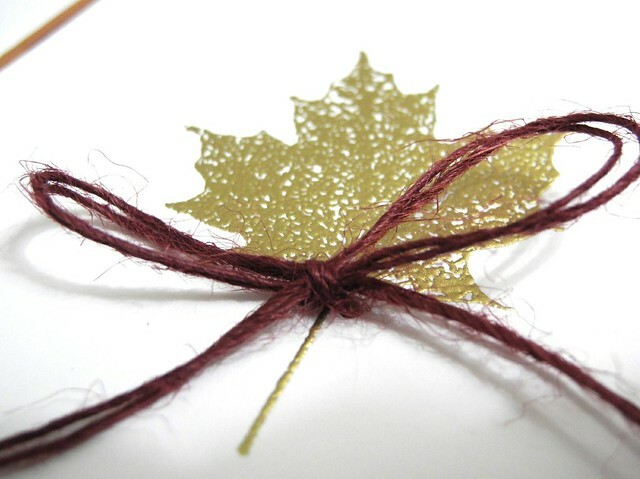 Love the new leaf stamp embossed in gold, just gorgeous! GORGEOUS! Love the leaves stamp set! Yes, digging the leaf, but loving the wood-look strip, and the sentiment is amaze balls. I love fall and this gold leaf just makes me happy. love this. 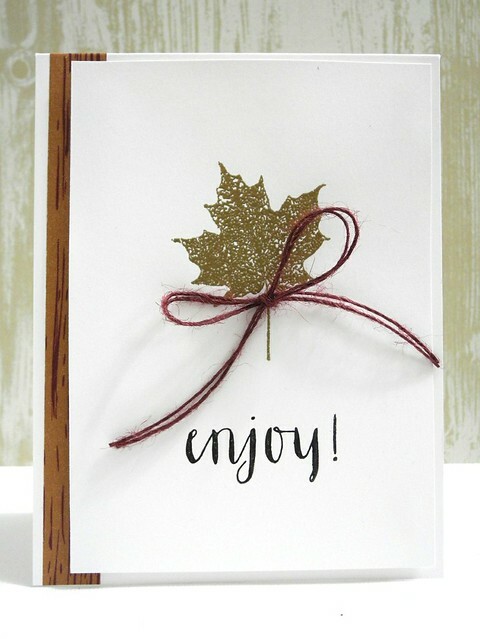 I can see why you're in love with this stamp set - your leaf card is gorgeous! This is gorgeous!!! Love the big leaf! Your gold leaf is gorgeous and I love the bit of woodgrain paper peeking out on the edge! This is so pretty! Perfectly CAS! love this--it would make a great guy bday card too--always on the lookout for those!